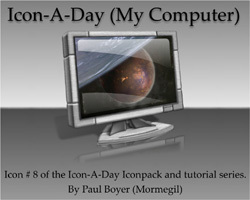 For all the Icon-A-Day tutorials visit my wincustomize site. Having that picture on the monitor, is incredible...great work. .ico? What about us dock users? OD can use the ICO file as well. I supose I could post them in PNG as well. As far as dock users...it's a simple thing to convert an .ico to a .png file. Right click on the icon...open with IconDeveloper...right click on the image to the right...click on export image as...choose .png and there ya go. Thanks Mormegil. I was not aware that OD supported ICO. Thanks webgizmos too. Handy tip.